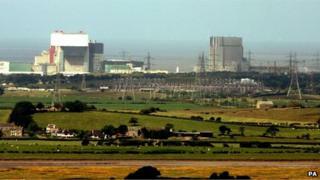 The electricity company EDF has temporarily shut down two of its nuclear power stations, Heysham 1 and Hartlepool. It said it was a precautionary measure after finding a defect, in June, in one of the boilers at Heysham 1. The problem was first detected during a routine boiler inspection, which led to one of the station's two nuclear reactors being shut down. All four reactors at the stations will be shut as they are of similar design. The company said all the boilers associated with the two nuclear reactors at Heysham 1, and with the two nuclear reactors at Hartlepool, would be inspected to make sure they were safe. "Until the results of the further inspections are known it is not possible to advise exact return to service dates for these four reactors, however, an initial estimate is that these investigations will take around eight weeks," said EDF. "EDF Energy's other nuclear power stations are not affected by this issue as they are of a different design." The company, owned by the French government, owns and runs other nuclear power stations in the UK: Hunterston and Torness in Scotland, Heysham 2 in Lancashire, Dungeness B in Kent, Hinkley Point B in Somerset and Sizewell B in Suffolk. The National Grid said the shut-downs would have no effect on the UK's supply of electricity which it said was "fine", helped by low seasonal demand at this time of year. "We have many generation sources to call on and demand is low at this time of the year," said a spokeswoman. The Office for Nuclear Regulation (ONR) revealed that the problem at Heysham 1 was an unexpected crack in a boiler. It said EDF would have to satisfy it that the reactors were safe to use again. "ONR is satisfied that EDF Energy is taking appropriate and conservative action in the interests of continued nuclear safety, and that they are seeking to obtain positive confirmation of the condition of the boilers." "There has been no release of radioactive material and no persons have been injured," it added.